This important, yes important, whimsical musical plays at CTC through June 10th. It's approximate run time is 2 hours, including a 15-minute intermission. What could be better than a critically acclaimed Children's theatre and a nationally recognized African American theater company? Well that answer is here and it's when they put their heads together for a truly awe inspiring collaboration between Penumbra Theatre and Children's Theatre Company with a production of The Wiz adapted from The Wonderful Wizard of Oz by L. Frank Baum. The Wiz is a different take on the classic tale of Dorothy and Oz. This original Broadway production was nominated for 8 Tony Awards in 1975 and won 7 of them including Best Musical, Best Original Score and Best Performance by a Featured Actress in a musical. Due to it's critical success, this musical was considered a breakthrough for large-scale big-budget musicals featuring an all-black cast and laid the ground work for musicals like Dreamgirls to succeed. A mere 3 years later, a film adaptation was released with some reprising their roles and Diana Ross playing Dorothy. Jump forward to the late 2010's when big networks began broadcasting live productions of these musicals and NBC produced The Wiz, Live! with big names like Queen Latifah, Elijah Kelley and Mary J. Blige. The story is a story we all know and love involving a girl from Kansas who is caught in a storm and wakes up in a beautiful and colorful land called Oz. In this production, P/CTC re imagines Oz as New York City. According to the director Lou Bellamy, this production pays homage to the "great migration" made when thousands of African Americans from rural areas made the move to urban living. This is reflected beautifully in Vicki Smith's incredibly designed set. As a huge New York City fan it was so fun seeing popular landmarks like Coney Island and Central Park while still paying respect to the whimsical land of Oz. Many who read my reviews know my feelings on projections. Sometimes they are great and sometimes they are horrible...spoiler alert: this one was great. Craig Gottschalk utilizes a backdrop projection screen just the right amount. It serves its purpose in elevating each scene without the actors and audience relying on it too much. Costume Designer Mathew LeFebvre also creates a stunning array of costumes from loud, colorful and vibrant munchkins attire to the definition of "serving looks" with ensemble Emerald City citizens. My absolute favorite was the stunning black and red gown that the Wicked Witch of the West, Evillene was wearing. If I were P/CTC I would highly suggest getting MIA to create an exhibit around these costumes and production in general because the costumes are easily one of my favorite things. Paris Bennett plays Dorothy flawlessly. Her combination of sass and power belting left me literally wanting her to sing "Home" over and over again. I'd pay money to watch her sing that song on an empty stage, that's how good it was. Her delivery and comedic timing were spot on too. Also through out the entire production I kept thinking "How old is she?" because of her willingness to fully act like a young girl but with a voice of a well trained and seasoned actress. Spoiler Alert: She's 29 but doesn't look a day older than 18. Age is just a number but it was quite a fun little fact I learned. Greta Oglesby sets the mood right away in the beginning of the show that this was going to be with the first number, a powerful ballad titled "The Feeling We Once Had"
She also played Evillene with such charisma and spice with a evil laughter that all villains should try to replicate. It's such a weird little thing to comment on but all I can think of was how amazing it was. Rudolph Searles III plays the Lion and has not only a gorgeous belt but also has a rich tone to his voice that blended so well with the other principal roles. Dwight Leslie plays the Scarecrow and wins the award for never letting his energy or character fall once. His characterization and physicality of the role was simple but so effective and really had me believing he was a scarecrow. Aimee Bryant plays one of the witches named Addaperle and is a delight to watch on stage, bopping and never missing an opportunity for a huge laugh from the audience. Also shout out for another beautiful and memorable costume that was the definition of a full blown cotton candy fantasy. Dennis W. Spears plays Uncle Henry and the Tinman. His physicality was spot on too with amazing robotic moves. The ensemble is all brilliant in their variety of roles including the best group number "A Brand New Day" which had me smiling and bopping along the whole time. Jamecia Bennett plays Glinda (and is the real life mother of Paris who plays Dorothy). Her rendition of "Believe in Yourself" had me reaching for the life alert button that I don't own because my heart stopped at how utterly life changing it was. Magnificent! Hey Twin Citie's Theatre Bloggers! Can I start the ballot for next year's awards because I've got some nominations from this show! This collaboration between Penumbra and Children's Theatre Company runs January 23 through March 18 and surely is a fantastic way to star the new year of 2018. After a few week break from seeing theatre (due to work responsibilities) this was the perfect show to jump into. It's not only a fantastic score with a well adapted story but also features some of the most impressive singing I've seen. Ticket information can be found here. One of my favorite things about the holiday season isn't just the holiday music, the presents, spending time with your friends and family and the holiday cheer. Oh no. It is the plethora of holiday shows that open across theater's in the Twin Cities. Last week I saw my first one of the season and it was How the Grinch Stole Christmas at Children's Theatre Company. This production is for families and people of all ages. Whether you're taking you're a grandparent taking your grandchildren or a mother bringing her whole family, this is a perfect thing to do this holiday season. I'm 24 and I took my sister who is 27 and we both loved it! For those who don't know, the story of the Grinch has been told in many different ways. It was originally a children's book by Dr. Seuss. Then turned animated movie and again into a real one featuring Jim Carrey. It's the story of a mean old Grinch who wants to keep Christmas from coming to the wonderful town of Whoville. He hatches a plan with his beloved dog, Max, to steal Christmas. The Grinch is played by Children's Theatre Company member Reed Sigmund and CTC couldn't have found a better actor to portray this iconic character. He is a perfect balance of menacing and hilarious. Sigmund completely embodies the Grinch through his physicality, voice, and interactions with the rest of the cast. He was born to play the Grinch. What makes this production special is the music as well. While it includes everyone's favorite "You're a Mean One, Mr. Grinch" it also includes original music with lyrics by Timothy Mason and music by Mel Marvin. These songs really made this production feel fresh and new. Everyone knows the story of the Grinch, so I was wondering what CTC would do to make this production new to people who've seen this story done many times. The music is what made it different. I absolutely loved it. Sigmund and Young Max (played by Natalie Tran) sang a song about how the Grinch was "One of a Kind" and it was by far my favorite song. This production is visually stunning. It's everything you'd expect from a production based off of Dr. Seuss. Tom Butsch, the scenic designer for the show, really outdid himself. Everything in this production screams SEUSS. It's colorful, bright, fun and absolutely a joy to watch. 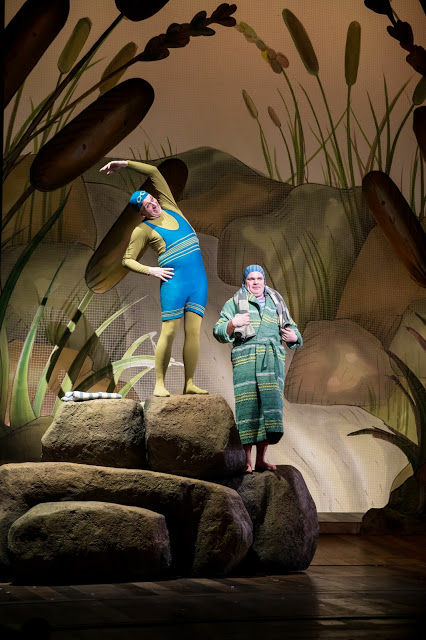 This also includes the costumes by David Kay Mickelson. I think the costumes were quite possibly my favorite things, creatively, about this show. The set has a few other tricks and surprises that I don't want to give away but it certainly is spectacular. Many families share a tradition in which they go to a movie theater and see the newest holiday-themed movies. I want to challenge that tradition. I want to challenge any family that does this and take the chance to see this musical instead. It's nostalgic and refreshingly new all at the same time. This production is perfect for any family who may just be dipping their toes into the theater, and it's appropriate for children of all ages. The Children's Theatre Company was named #1 Children's Theatre in the nation by TIME magazine. It produces, year after year, some of the highest quality of production for young audiences, in the state and country. Their commitment to inclusion and diversity, educational programs, educating through performance and, for this production particularly, new play development, makes them one of the most ambitious and successful theatres in the Twin Cities. For goodness sake, they are the only theatre for young people to win a Tony Award for Outstanding Regional Theatre! This fall, CTC opens with Minnesota's very first hockey musical, The Abominables. The musical is produced in association with New York City theatre company, The Civilians. It's written and directed by Steve Cosson with choreography by Joe Chvala. The music and lyrics were written by the late Obie winner Michael Friedman, who tragically passed away a few days before its opening. You can read CTC's statement about his passing here. The Abominables musical takes place in Prairie Lakes, Minnesota and is centered around multiple families who are all somehow involved with youth hockey. A new family moves in town who has a young boy, Harry (played by Ryan Colbert), as well...however, he isn't like the others. He is a yeti (not abominable snowman, a yeti as they say). He is tall, strong, roars and is an amazing hockey player. He even has white fur! When Harry makes the "A-team" and Mitch gets booted onto the "B-team" it feels like his whole life is falling apart. Ahh, teenage angst, don't we all remember it too well? However, he has a plan to get back on the "A-team." The Abominables features an all-star cast from the youngest all the way to the oldest local talent of the Twin Cities. Each cast member perfectly encompasses the culture around a Midwestern family that is completely intertwined with the craziness that is youth sports. Let's start with my favorite, all the mothers. Let me also preface by saying that I never played hockey, however, I did grow up in Andover, Minnesota so I've met a few hockey moms in my day. These women did their research because they perfectly capture the spirit, love and...we'll say strong commitment to their children's teams...was extremely spot on. Autumn Ness plays Mitch's mother, Ellen. Her slight hint of a Minnesota accent, without going full Fargo, was brilliant. Her body language and comedic timing were superb. Elise Benson plays Judy, Harry's mother. Her portrayal of Judy's naive-ness to the basics and culture of youth hockey is like a glimpse into my future if my children decide to play some sort of sport. Stephanie Bertumen manages to portray multiple roles to round out the rest of the different types of hockey moms. Put these three together on stage and they blow the ceiling off. Even if you're a parent and not a sports parent there are still a lot of relateable aspects of the musical. For example, in one scene the parents are freaking out and constantly refreshing the online page where the teams will be posted. While I didn’t play hockey, my mother later admitted to me that she had flashbacks of when I would hang around the drama department call board waiting for the cast list to go up. Same anxious feeling just different activity! Let's also talk about the amazing set designed by Andrew Boyce. The entire floor set was extremely lifelike of a hockey rink. The floor literally looked like ice as the actors skated across it. When you look above there is a gorgeous wood finish that gives it a real "up north" feel, which gives it a nostalgic feel for the Minnesotans in the house. Can I let you in on a little secret though? After attending a behind the scenes event of the production a few weeks ago with some other influencers, I was informed that it's not even wood finish! It's Styrofoam with an amazing paint job! While the set included large moving pieces and plenty of flats to transform the rink, including bleachers on the back and sides for parents to sit, they all moved very smoothly. Never once was I feeling that awkward feel that theatre-goers are all too familiar with when we think "Are they done changing the scene? We've been sitting in this black out for awhile." Kudos! As I mentioned before the actors who played hockey players were literally on roller blades! This was an ambitious move on CTC's part and it paid off. It really elevated the entire performance as actors flew in and off the stage in full hockey gear, chasing an imaginary puck. During our behind the scenes tour a few weeks ago, I learned that only two of the actors knew how to skate and the rest had to learn while in rehearsals! That's pretty impressive for how fast and skilled they were. Another notable feature of this musical were the songs. They were brilliantly written and sung by the cast. The beginning of the musical even features a song about being Minnesota nice with a perky and staccato feel. It had the entire audience laughing because…well it was true! Even if we are sometimes extremely passive-aggressive, we are ultimately very “Minnesota nice.” I am anxiously waiting for CTC to release a recording of this musical! Hopefully they will in the future! The Abominables is an extremely fun musical for audiences of all ages and interests. I’m not even a hockey fan and I loved it! The cast is an all-star cast and features some very notable and recognizable faces from the Twin Cities Theatre scene.The set is absolutely beautiful and works in every scene. The production has multiple messages for audiences as well including never giving up, trying your best and being yourself. The Abominables runs through October 15 at CTC. Be sure to get your tickets or enter my contest (info below) to win two free tickets to any performance! You can also get tickets here.